The Flames fell in overtime in game 2 by a score of 3-2. 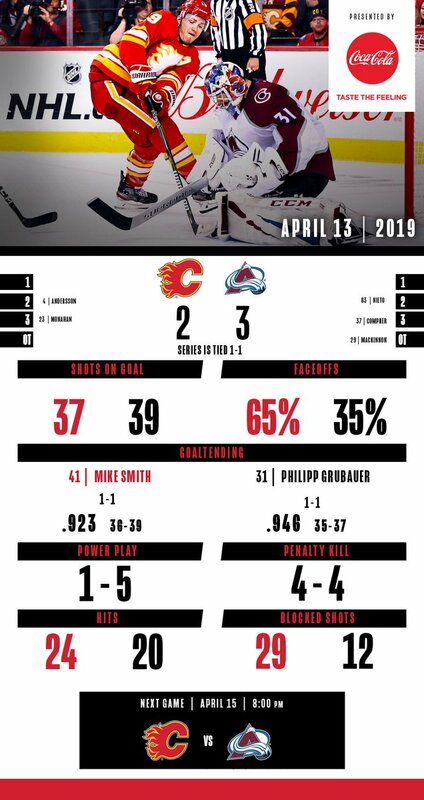 While Nathan MacKinnon played like he was on steroids, HGH, speed and whatever other bodily substance you can think of, the Flames nearly pulled last game out. 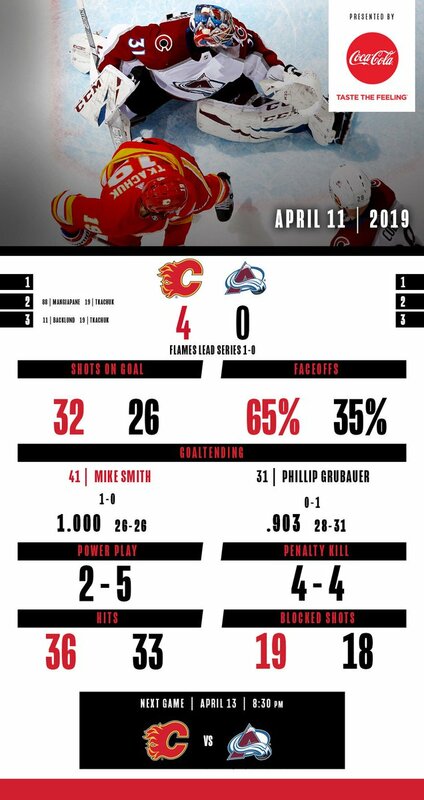 A lucky bounce for the Avs to tie, and a lucky bounce to keep the puck out of their net in OT were the two big game breaks. at they appeared in the game 2 post game thread. The game will be broadcast on CBC, CNBC for our American friends, et mes amis qui parle la lang français TVA Sports 2. Last edited by Maritime Q-Scout; 04-15-2019 at 04:00 PM. Thanks for the thread, and good morning from out east! It's going to be a long day waiting for this one GFG!! Good morning. After sleep deprivation due to anxiety for this game, I am suiting up and supporting the troops. Wearing a Jersey to work and the turtle is playoff ready! Let's feast on the Avs! Go Flames Go! Let's just erase that Game 2 memory swiftly, shall we? Sweet! I will need a nap later myself, heh. Whose jersey are you wearing? I have tossed mine (Chucky) on already, but only for the cats' entertainment because I am gloriously off work today/tonight. Sorry in advance, neighours! GFG! It is Blue and White day here in Toronto. Not for me. Today is a Red Day! GFG! Hopefully we will see more urgency on the road as it's a bit of a disappointment they wasted one of Smith's best efforts in game two. It would be nice to get off to a quick start and have the Avalanche abandon their defensive shell which has been surprisingly good thus far. I am also rocking Chucky at work today, but will later switch to Gaudreau Adizero away. The tradition is; I have to wear what they are wearing on the ice during the game. Best moves the Oilers can make. Draft players. Ship them off. Re-sign when developed. Gio-Brodie is a top three defense pair in the world. Fullstop. Only other two on the same tier are Vlasic-Karlsson and Ekholm-Subban. Quote me on it. More games to play, more tortures to issue! champions. Forget winter, That Darn Puppet is coming!!!! Really really curious to see how the first 10 mins go in this one. Do the flames come in on fire and trying to dictate play or will they try to 'weather the storm'. I feel like other than parts of the 3rd/OT, the flames have been trying to weather the storm. I've got nothing but confidence going into tonight's game. Game 2 was a big playoff hockey lesson and you could see with they way OT was played they caught on quick. Big win coming. Last edited by foofighter15; 04-15-2019 at 07:27 AM. The Avs needed to play their best game of the season, couple with a sleeping Flames team, all with a Super Human performance from Mack just to squeeze out an OT win. If the Flames play like they can, they will win. I have a feeling it will be a high scoring win for the Flames. 6-2 for the good guys with Gaudreau and Neal getting on the scoresheet with 2 goals each. The Flames are the better team. They will probably win tonight. And the next game. And the game after that. Flames win this no problem. Lets see if McKinnon can continue playing 25 plus minutes. The kid is a stud. He can absolutely play 25 minutes a night, especially when there's a guarantee of no back to backs. He might wear out after a couple of weeks, but that won't help us in the first round. The Flames are going to win this series, but MacKinnon is gonna wear our guys out more than we're gonna wear him out.